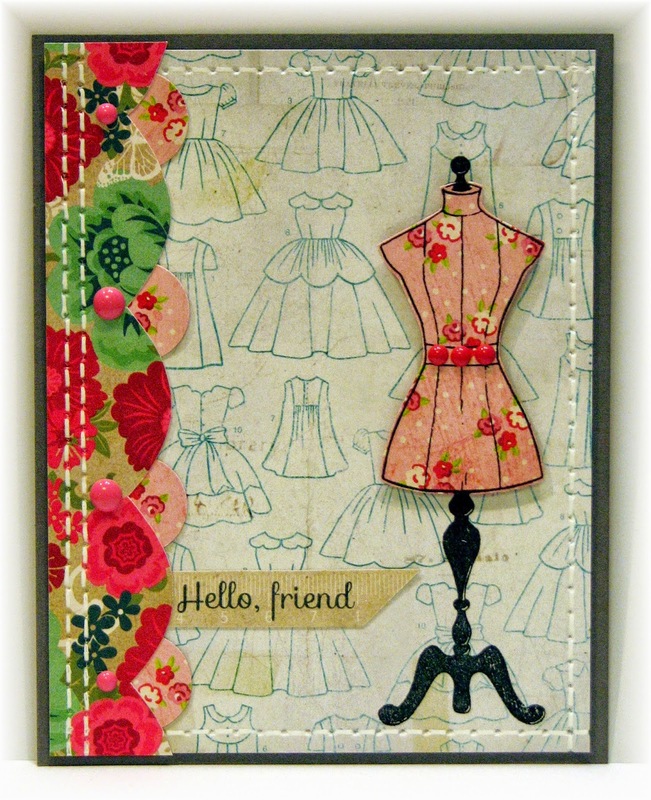 The Rubber Cafe Design Team Blog: A Vintage Hello! I have a fun vintage card for you today for The Rubber Cafe, featuring this month's Good Times To Follow Creative Cafe Kit. I used the Scor-Pal and Scor-Bug to create the stitching detailing on the main panel of the card and then used a white gel pen to sew my card together. I stamped the dress form image onto the designer paper with Onyx Black Versafine Ink. I stamped the form portion again onto some of the designer paper and then popped it up on foam tape and added some of the enamel dots from the kit to the center. The scalloped detailing down the edge is a bit of the pink scalloped paper that I cut out and then flipped over to the reverse side. I punched little circles from the coordinating papers and tucked them in for an additional faux scalloped detail.